The Signing of the Treaty of Greene Ville, 1795, as depicted by Howard Chandler Christy (painted in 1945). Anthony Wayne dictates terms to the Indians. This painting is currently hanging in the east stairway of the Rotunda of the Ohio Statehouse. Following General Anthony Wayne's victory at Fallen Timbers in August 1794, General Wayne withdrew his forces and setup a winter camp at Fort Greene Ville. In January of 1795, several members of the western tribes assembled at Fort Greene Ville to settle on terms of peace. Representatives of the Wyandot, Delaware, Shawnee, Ottawa, Chippewa, Potawatomi, Miami, Eel River, Wea, Piankeshaw, Kickapoo, and Kaskaskia. Once the general terms were agreed to they tribes departed for their own villages to discuss the terms. General Wayne sent the transcribed document to President Washington for his approval. The parties returned to Greene Ville and on August 3, 1795 signed the treaty. In so doing they agreed to cede claims to lands east of the Cuyahoga River to Fort Laurens in Tuscarawas County, and south of a line running west to Fort Recovery. In return, the United States offered payment and annuities in the form of goods and ceded claim to most land north and west of the treaty line. This treaty marked the end of the Indian Wars in the Ohio Country, forsaking boundary violations by both parties, and established the official western border of the United States, opening much of Ohio for settlement. The treaty was not perfect by any means and the peace between the Americans and native peoples of Ohio would not last. Confined to only about 1/4 of the land that had supported them for 100s of years, the Shawnee, Delaware and Wyandot peoples suffered. Traders who had long been known to supply alcohol to the indians to gain advantages over them, again began fueling the fires of the native peoples depression. Some of the warriors became drunkards. But others, particularly the Shawnee were living near present day Wapakoneta, turned their backs on the old ways, and tried to become a part of the encroaching American civilization. Over the next 10 years from the signing of the treaty, the government continued to acquire more Indian land through purchases and new treaties. A shift in American policy also began after the signing. With the destruction of so many Indian villages and crops, they became increasingly dependent upon others for their survival. It was feared that with Ohio's close proximity to the British north of the Great Lakes, the Indians might turn to them for sustenance that would eventually lead to further inroads by the British into the northern Ohio territory. One Native American rose to power during this time. His name was Tecumseh. He scolded the signers of the treaty for giving away lands they had no right to give away. As time passed the number of like-minded Native American's increased, Tecumseh began traveling across the country trying to enlist more Nations to band together to resist the Americans. The Shawnee leader eventually amassed a force of about 2000 warriors from various tribes found in the Northwest Territory. Native Americans were never of one mind or purpose and Tecumseh found it difficult to unite them in one cause. Frustrated, he turned to the British/Canadians for help. Although they did supply him with essential materials and supplies, it wasn't until the Americans declared war on the British in 1812 that the actively supported those under the leadership of Tecumseh. Tecumseh was killed in one of the last battles of the war, thus ending Tecumseh's dream of a united Native American Nation. ABOVE: Shown is part of the actual wampum belt given to Anthony Wayne at the signing of the treaty. Traditionally wampum belts were rows of marine shells strung and tied on buckskin thongs by American Indians. The wampum belt served to record agreements made during peace negotiations to confirm the speaker's sincerity. The belt is on display at the Ohio Historical Center in Columbus. 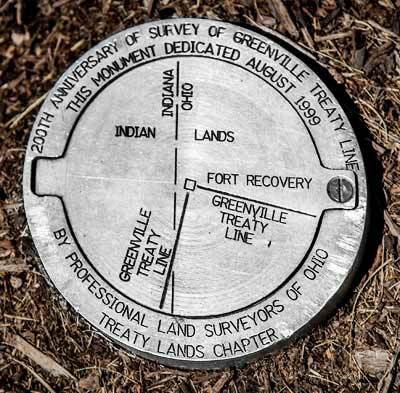 Today, there is a marker in the city of Greenville that commemorates the signing of the Treaty.